What Makes Room Dividers Stable? Back in my college days, about 10 of us would pile into my roommate’s Chevy Caprice and drive. We went to the park or grab a bite to eat, anything to get us off of the college campus for a bit. Dani’s Chevy wasn’t the newest car, and with all of that weight well you know the shocks on that poor mammoth of a car were getting pretty bad. One day it was snowing like crazy and we were heading to the movies. All of a sudden we hit a bump or a divot and we were airborne! It was really scary but we were all fine. When my friend came back to school after Christmas break, she had a nice new set of shocks! The guys complained about uneventful trips though the girls were extremely relieved. When the designers placed wheels on the Screenflex room divider, they found that similar to shock absorbers, self-leveling casters would provide safe and stable contact with your floor and in transporting units during setup and storage. Even if your floor has some dips and bumps, your divider will remain stable and straight. Screenflex Room Dividers provide unparalleled flexibility for what you’ll be able to do with your new found space. One of the local churches in the area uses Screenflex for various meetings, over 50 of their ministries share their space and use Screenflex to do so. Room dividers creatively cut distractions and noise for religious education classes, women’s programs, men’s programs, dance classes and much more. I read this article about the importance of shock absorbers, and not only are they on every car in the world to provide a nice comfortable ride, but they also keep you safe! For example, of your car was to hit a bump or hole and bounce with no shocks, your car could actually leave the ground and possibly cause and accident. Similarly, if any of the wheels along the bottom of a room divider were to be fixed in place (without self-leveling casters), the wheels not touching the floor in low spots could cause the divider to become unstable. The reason is that no floor is perfectly level. We place self-leveling casters on our portable room dividers because the self-leveling casters will read your floor. Let’s say you are transporting your room dividers from room A to room B and the surface of the floor is not quite level. Like shocks on a car, self-leveling casters work to keep all of your casters on the ground. When the divider is set up straight, even contact and weight support is made along the entire length of the divider. 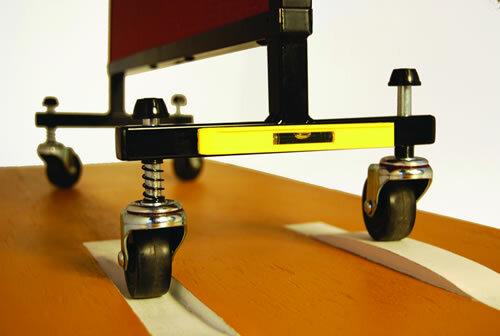 Self-leveling casters help to keep dividers stable and safe.